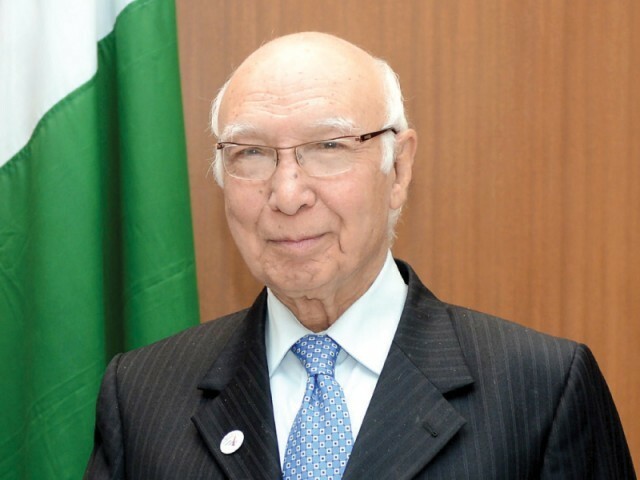 ISLAMABAD, Sept 22 (APP): Advisor to the Prime Minister on Foreign Affairs Sartaj Aziz Thursday said that Pakistan was ready for unconditional talks with India to resolve various issues including the core issue of Kashmir between the two countries. “Pakistan wants to resolve the issues diplomatically and was ready for talks with India but such kinds of talks between the two countries should be unconditional,” he said while talking to a private television channel. He, however, said talks between the two countries could not succeed till resolution of the Kashmir issue. He said Prime Minister Muhammad Nawaz Sharif forcefully raised the Kashmir issue and brutalities of Indian occupied forces in Indian Held Kashmir at the 71st session of the UN General Assembly. He said the international community accepted that Kashmir was a disputed issue and the Prime Minister’s address in the UN to highlight the issue would have good impact from the world on India. Aziz said the Prime Minister met eight heads of state and three members of the UN Security Council and apprised them of the current situation in Indian Held Kashmir and brutalities of Indian forces on innocent Kashmiris. He said the world leaders expressed sorrow over the use of force in Occupied Kashmir and escalation of tension between Pakistan and India. He said the Organization of Islamic Cooperation (OIC) had also expressed concern over human rights violations in IOK. The Advisor said international pressure was now mounting on India. To a question, he said, the real change had happened in ground situation where new generation of Kashmiris has risen spontaneously against India’s illegal occupation – demanding freedom from occupation. He said it had badly disturbed the Indian government. To another question, he said, Indian state actors were involved in interfering in Balochistan. About aggressive Indian policy, he said Pakistan had the ability to thwart any kind of aggression from India and our armed forces were fully capable for security of the motherland.